We are currently in the process of gathering performers. If you are interested in sharing your story please complete your submission by March 31. Join CNOW at Equal Pay Day Chicago 2019! Help us raise awareness of pay inequality in Chicago and around the world. Each year, Equal Pay Day is recognized worldwide to bring greater awareness to racial and gender pay disparities. The 9th Annual Equal Pay Day Chicago will be held in advance of this year’s nationally observed date of April 2 – which symbolically marks how far into this year the average woman must work in order to earn as much as the average white man last year. The local event is both a focal point to raise awareness of pay equality and a platform for organizations to collaborate across the state. Join CNOW in the fight for pay equality at Equal Pay Day Chicago 2019! 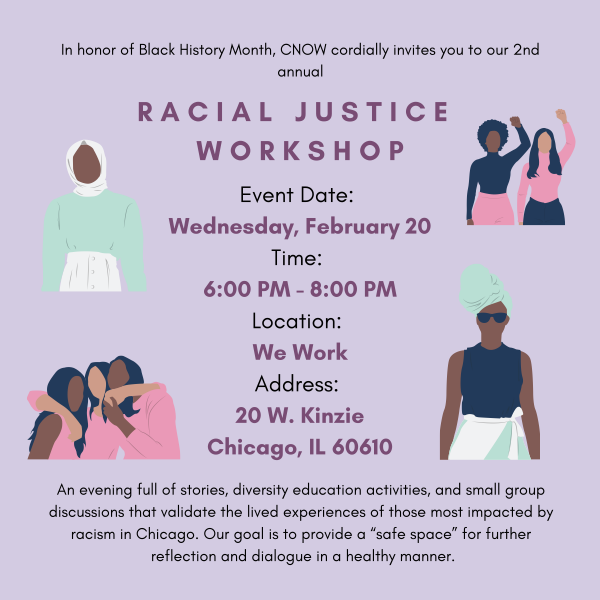 CNOW held its second annual racial justice workshop, “Ending Racism in Chicago NOW: A Critical Race Theory Community Education Workshop,” on Wednesday, February 20, 2019 from 6:00 pm to 8:00 pm at We Work, 20 W. Kinzie, Chicago, with more than 30 people participating. 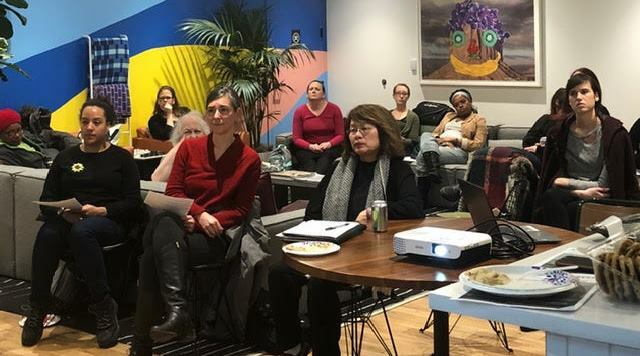 The event began with a discussion about the importance of inclusivity in feminism, CNOW’s continued commitment to intersectional feminism, and how having difficult conversations in safe spaces is essential to advancing these causes. Attendees participated in a “privilege walk,” an exercise designed to demonstrate the many ways in which society privileges certain individuals over others, allowing participants to reflect on the different areas in their lives where they have privilege and where they do not. Participants then met in small groups to share personal experiences regarding their backgrounds and demographics, including neighborhoods, housing, education opportunities and career paths, and to reflect on their first perceptions of racial awareness, confronting white privilege and more. Large-group discussions focused on racial disparity and equity in Chicago, the racist history of Chicago’s housing policies, the state of Chicago Public Schools, and the vast impacts of structural discrimination and racism on people of color – including wealth disparities, housing segregation, racial profiling, poor education, underemployment, the school-to-prison pipeline and shortened lifespans. 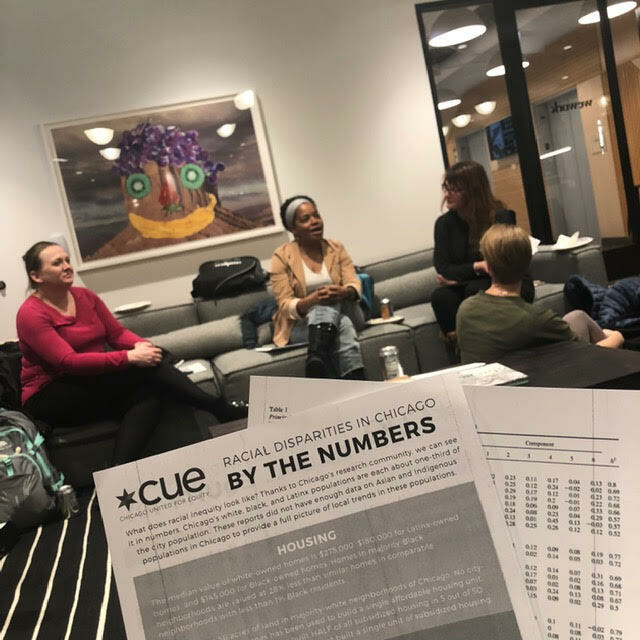 The group also discussed the definition of racism, daily microaggressions against people of color, and elements of critical race theory (CRT) – a social-scientific approach to the study of race, racism and society. The workshop concluded with a discussion about the importance of each person effecting change in their own sphere of influence.